Please call before ordering to get accurate and best shipping costs to your location. Now is the time to graduate! You are making lots of honey and need a good rugged, simple, powerful workhorse machine to generate volume. The Maxant 9 frame power extractor is built to last a lifetime. It will hold 3 deeps tangentially and or 6 medium/shallow frames extracted radially. 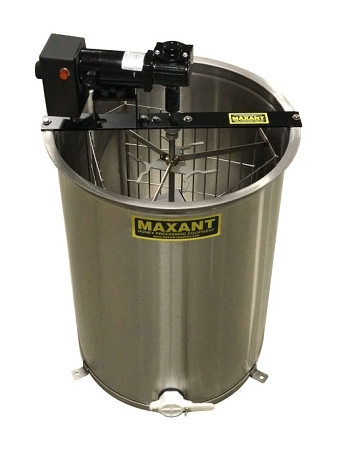 No more cranking using this powerful electric extractor.These tanks are constructed from 20 gauge #4 polished stainless steel, with a conical bottom TIG welded for maximum draining. This is QUALITY. You will be amazed at the remarkable engineering of the inner basket which can hold up to nine frames. The inner basket is 100% stainless steel. TIG welded and tested on balancing machines. Stiffening rings located at the top and bottom. Will extract wood or plastic frames with no modifications.